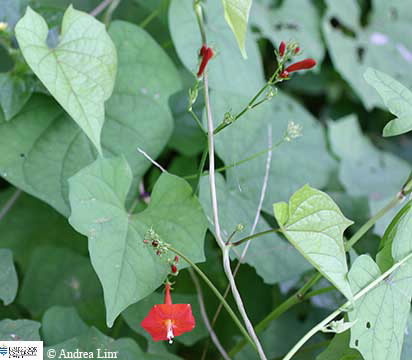 This vine, which is a garden escape, has leaves which vary in shape from entire to 3-lobed, the base is cordate or heart-shaped. Some small domatia may be present on the lower surface of the leaves. The flowers are trumpet-shaped; the red petals are initially fused to form a tube but then flare at the top, 1.5-2.5 cm diameter. Stamens and style are much exserted. Fruit is a capsule to 7 mm diameter, the sepals with their awn-like appendages are persistent at the base.